He’s ba-a-a-ack — to screw up again! Activists with the right-wing group Project Veritas embedded with campaigns of unknowing Democrats across the country ahead of the midterms. And in most cases, candidates didn’t know they were a target until they saw the finished videos. So far, the controversial group led by founder James O’Keefe, has posted undercover videos with liberal campaign workers or candidates in six tight races. … O’Keefe’s tactics of secretly recording targets to expose them have attracted a barrage of criticism over the years and many of the group’s previous videos have been discredited partly because of the edits and cuts, allegations O’Keefe denied while talking to USA TODAY. What happens when an effort to ride the coattails of Trump’s “invading aliens caravan” reveals that a candidate’s campaign has compassion for refugees? Oops! And here’s the problem, Project Veri-Shady: What Team O’Rourke did is perfectly legal! 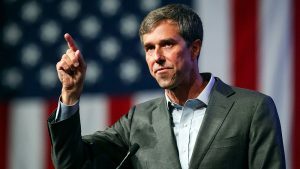 O’Rourke’s campaign said that the staffers were responding to an unrelated incident last week in which the federal government dropped off over 100 migrants seeking asylum at a bus station in downtown El Paso. The El Paso Times reported that bus station officials then called Annunciation House, a Catholic nonprofit immigrant shelter.